On a cold Monday night at the V Bar in Berwyn, the room radiated energy as a group of young people gathered to build a grassroots political campaign that has never been seen before in their community. “Some of you might recognize me as the voice of the announcements from the class year of 2012,” said Gerardo Nava, as he introduced himself as a supporter. “I have been involved politically, not so much in Cicero because, at this point if you live in Cicero, you know how the politics are. But now we have the opportunity to take that landscape and make it our own. I’m really excited to see what can happen,” added Brenda Hernandez, campaign manager for Morton High School District 201 board candidate Esteban Rodriguez. Meeting at the bar were several candidates running for local office in the upcoming election. This was an opportunity for the respective teams to meet each other and discuss how they can collaborate. Most of the candidates and their teams are young Latinx-Americans who grew up in either Cicero or Berwyn. In total the group is running a slate of six candidates for the school boards and Cicero town trustees. Laura Polanco is running For elementary School District 99. Edwin Robles and Esteban Rodriguez are both running for high school Morton District 201 and Luz Chaheine is running for Morton Community College board. In addition, Blanca Vargas and Jeanette Alanis are running for Board Trustees of the Town of Cicero. Cicero is a predominantly Mexican immigrant community, a suburb bordering the Southwest Side of Chicago. In District 99, the students are 90 percent Hispanic. District 201 has 89 percent Hispanic students and Morton College has 84 percent. Rodriguez, 30, graduated from Morton East High School in 2006. He studied psychology at the University of Illinois-Chicago and went on to get a master’s degree in Public Administration from Baruch College in New York City. He grew up in Cicero in the 1990s during a tumultuous period when crime was high in the area. “I saw it all. I saw dead bodies being dragged while we played. We saw shots. We saw cars getting burned, houses getting robbed. We saw gangs,” he said. While Cicero has changed and gotten much safer since then, problems remain, the candidates say. Rodriguez prides himself on the work he’s done to improve the community. He spent years working at Corazon Community Services, a local nonprofit youth servicing agency, where he was director for Health Programs. During his time there he led efforts for comprehensive sexual health classes at the high school, which helped dramatically reduce teen pregnancies. Rodriguez currently works at a housing agency in Chicago. “I always had issues with local politicians who prevent good agencies, who have good intentions, to help. Instead of collaborating and supporting, they [local politicians] put a barrier and they try to compete,” he said. It was Rodriguez’s extensive experience in the nonprofit world and working in the Cicero community that ultimately led him to decide to run for school board. Like Rodriguez, Edwin Robles also grew up in Cicero and the two of them are running together for District 201 school board. Of the six candidates who are collaborating, Edwin Robles, at age 23, is the youngest. He graduated from Morton East High School in 2014 and attended Morton College before he graduated from the University of Illinois-Springfield in 2018 where he majored in political science. During his time as UIS he served as the Student Trustee. He’s also worked in the office of Representative Lisa Hernandez. 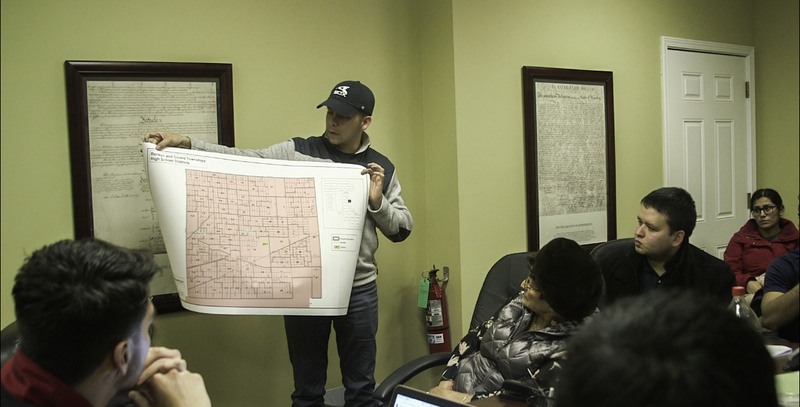 “Telling people that you’re from Cicero it’s kind of like, ‘Whoa, you’re from there?’” Robles said. “It’s a negative stigma,” added his campaign manager Alejandra Murillo. Murillo and Robles have known each other since they were kids. In fact, many of the people on Robles’ campaign team are old friends from high school who met through the school’s Debate Team. “We’ve been protesting the grading system together since we were in high school,” said Anna De La Torre, another member of his team, referring to her perspectives on the district lowering standards to increase graduation rates. Robles and his friends all say they had similar experiences in high school and felt unprepared when they went on to college, especially after hearing the experiences many of their new peers had in their schools. “You go to college and that’s when it hits you. Like, these people had these clubs, like some exotic clubs. We barely had a math class,” Jessica Romero said. When it came time to apply for college many of them felt as though they didn’t know what their options were. They claim their counselors didn’t help them with their college applications and, since their parents were Mexican immigrants who didn’t speak English, the students felt like they were pretty much on their own. The experience of Robles and his friends is what moved them to change the school districts. “My parents were always like ‘Don’t get involved in politics’ and my dad would literally say ‘Politics is a white man’s game. That’s not for you,’” De La Torre said. The next few weeks and months will see many fundraiser events, canvassing, and phone banking as the six candidates and their teams work together to mobilize their community and spread awareness of their slate. Their immediate attention is on the Feb. 26 election for the Town of Cicero Trustees where slate members Blanca Vargas and Jeanette Alanis are running against incumbents John Cava and Victor Garcia. Although, according to the organizers, both Vargas and Alanis were recently removed from the ballot as a result of a signature challenge which they are contesting. The next election will occur on April 2 for the three open positions on the District 201 school board. In addition to Robles and Rodriguez, incumbents Mark Kraft, Lido Manneti, and Jeff Pesek are also running. For the District 99 race, in addition to slate member Laura Polanco, incumbents Derek Dominick, Tom Tomschin, and James Terracino are running. In 2015, all three ran unopposed and won re-election. “I feel compelled to do something because I see a lot of things that are wrong in our district. Our kids are falling depressed and I want to see things change,” Luz Chaheine said at the gathering at V Bar. Her campaign for the Morton College Board also heads to election on April 2 where she will be facing incumbents Frank Aguillar and Fran Reitz. Morton College has had its own share of problems, as the community college could possibly lose its accreditation. 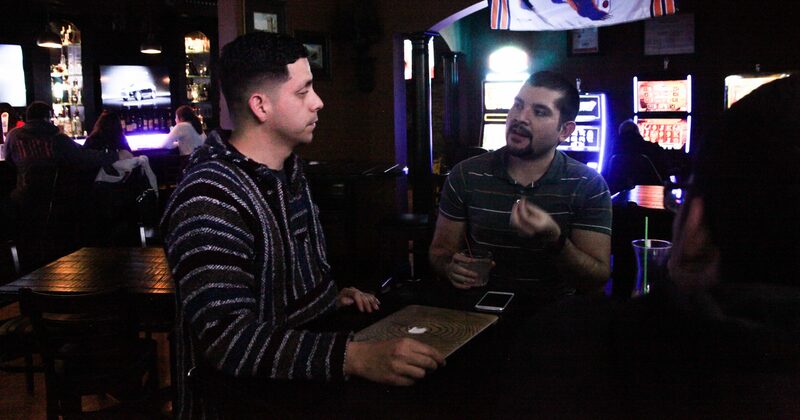 A week after the candidates and their teams met at V Bar, Robles held a campaign meeting in Cicero. The meeting started off with about six people sitting at a table to discuss their upcoming fundraising and canvassing efforts. But, as the meeting went on more and more young people entered the room. More chairs had to be gathered. More handouts had to be distributed. The room filled up even more, so much so that people had to stand in the back and listen. As the meeting wrapped up and people were getting ready to leave Robles stood up and said one last thing.